For the most part, I am not partial to intensely chocolate desserts. Of course, I like chocolate bars and chocolate ice cream, but those fancy-schmancy, five-tier, molten-nonsense cakes do not interest me. At all. I like my chocolate pure and simple. I don't like anything to complicate it or dilute its flavor. When I was younger, I always ordered the chocolate option off of the dessert menu at restaurants. It didn't really matter what it was because, if it contained that prized ingredient, it would satisfy me. Maybe it's because I ordered them time and time again. Maybe I over-ordered. 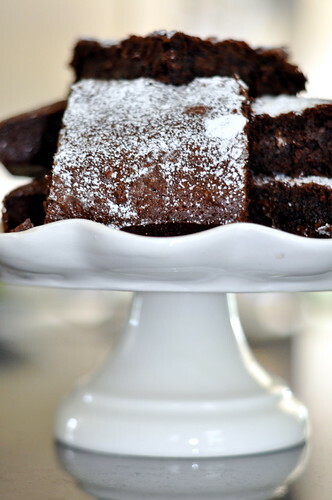 However, there is one chocolate confection that still tempts me at every bake sale, pool party, and afternoon picnic- the brownie. 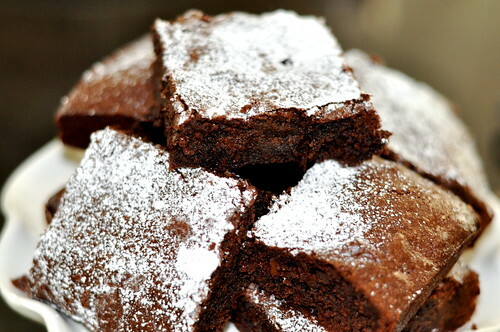 Brownies are wonderful things. They keep the heady flavor of the chocolate, but they provide a moister, chewier texture. 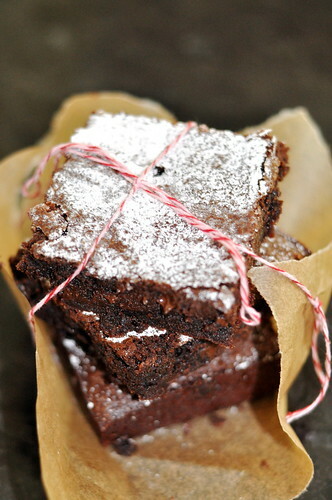 Because of this, brownies are always the biggest sellers at bake sales. Brownies have never failed me. 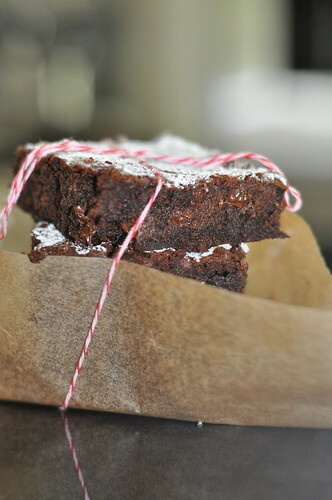 Something about them just calls to people, enticing them to buy every brownie on the table. Even at home, the brownies are always gobbled up before I can have one! I recently started an internship testing recipes for Nathalie Dupree for two cookbooks that she is developing. It is such an amazing experience, and I could not imagine anything more fun than getting to cook and bake all day with three women who are as passionate about food as I am. Nathalie is participating in a tag sale for Les Dames d'Escoffier, and Julia, Allison (the other interns), and I were given the task of creating something sweet to sell at the tag sale. We set out very ambitiously, planning to make macarons, but then rethought our plan. We knew that brownies were unfailingly popular, so we decided to make a few variations of brownies instead. We made peanut butter brownies, cream cheese brownies with chocolate buttercream frosting, toasted pecan brownies, and the dense, fudgy brownies from Baked. They are so rich and intense that a tiny square will satisfy your itch for chocolate. Trust me, you should make these. Preheat the oven to 350 degrees. Grease an 8-by-8-inch baking pan, line the bottom with parchment, and grease the parchment. Whisk together the flour, cocoa powder, and salt. Melt the butter in a heavy-bottomed saucepan with the espresso powder. Add the chocolate and stir until the chocolate has melted. Remove the saucepan from the heat and add in the sugars, stirring until the mixture is no longer grainy. Stir in the eggs and vanilla. Add the dry ingredients and stir until just combined. Fold in the chocolate chips. Pour the batter into the prepared baking dish and slide into the oven. Bake for 28 to 30 minutes, or until a toothpick inserted into the center comes out clean. Allow to cool on a wire rack before slicing. goooooey on the inside !! that is the way brownies should be.